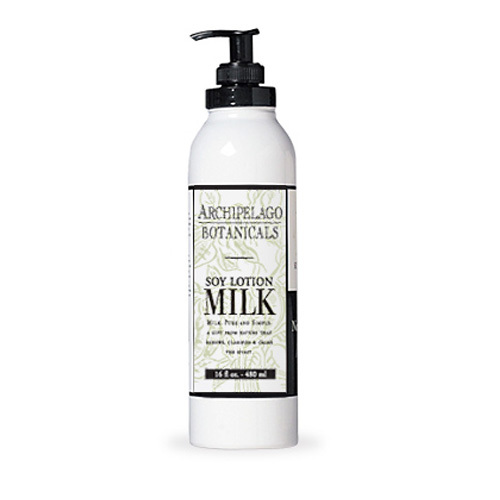 Archipelago's Soy Milk Lotion is a favorite among nutrition experts, soy extract - a primary ingredient in Archipelago Botanicals' Soy Milk skin care - is the perfect moisturizer additive: the proteins, amino acids and lipids in this high-powered bean allow for rapid hydration and skin regeneration. Nourishing dried milk solids and soy proteins combine with our award winning body Lotion formulation - considered by many to be our best moisturizing body lotion - which leaves your skin supple and soft to the touch. Contains jojoba esters for smooth, non-greasy application. 18 fl oz.